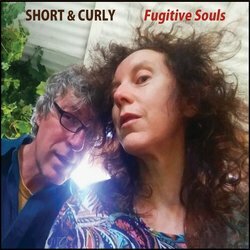 Short & Curly are a country/blues/folk duo based in Bridgetown, in south-west Western Australia. 600 gigs all over WA at festivals, wineries and in beer gardens. Honest vocals and uncomplicated instrumentation are trademarks of the Short & Curly sound. Similarly, they aim for directness and clarity in their songwriting. They released their second album of original songs, 'Fugitive Souls', in 2018 and one of its tracks, ‘Three Stories to the Truth’, was nominated for a West Australian Music (WAM) Song of the Year award. 'Fugitive Souls' was recorded near Bridgetown, at Pemberton, using local musicians. Co-producer and engineer Greg Lee Bird also worked on the duo's first album, 'Where Our Paths Cross'. Short & Curly plan an extensive tour in 2019 which will begin in WA and continue into the Northern Territory, potentially taking them right around Australia. Title track Fugitive Soul was inspired by Short & Curly’s move in 2007 from the big city (Sydney) to a small town (Bridgetown); from four million people to four thousand.